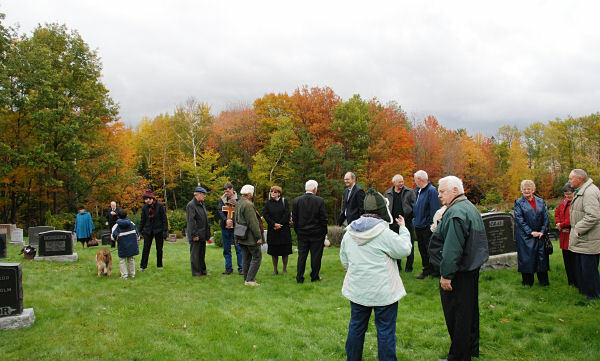 About 40 people attended Flemming’s burial ceremony at Abercrombie Cemetery in Pictou County on October 18, 2009: immediate family, old friends, cousins and more distant relatives, retired ministers etc. 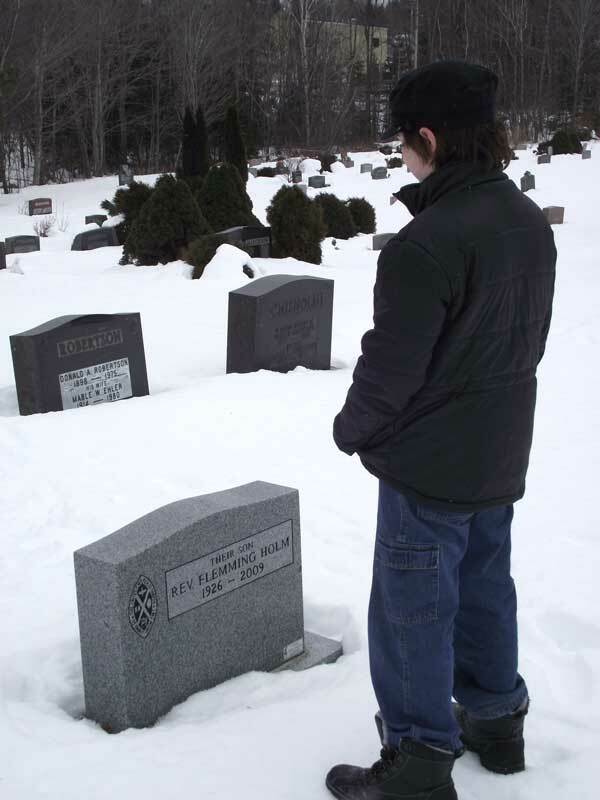 At Flemming’s suggestion, we buried his ashes between his parents, and we will have his name inscribed on the back of their tombstone. It’s very fitting for them to be buried together, as the three of them came to Canada together Denmark in 1929, not knowing if and when they’d ever be able to go back and visit (they did, but only 30 years later), and made their way here in the “new world” as a family unit. We – his children, grandson, his nephew Danny and his son, grandnephew Brad Parker, and spouses – dug the grave ourselves, between his parents’ ashes. Even the kids (Malcolm and Guillermo) put their backs into it. 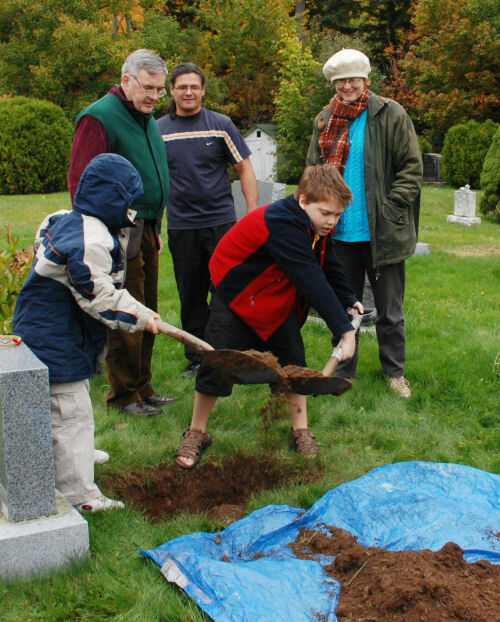 We felt the digging was important, as we were striving to ground and make as real as possible our experience of a loved one’s death, rather than leaving the work to others. For most of us, it was our first experience of the death of an immediate family member. Rev. 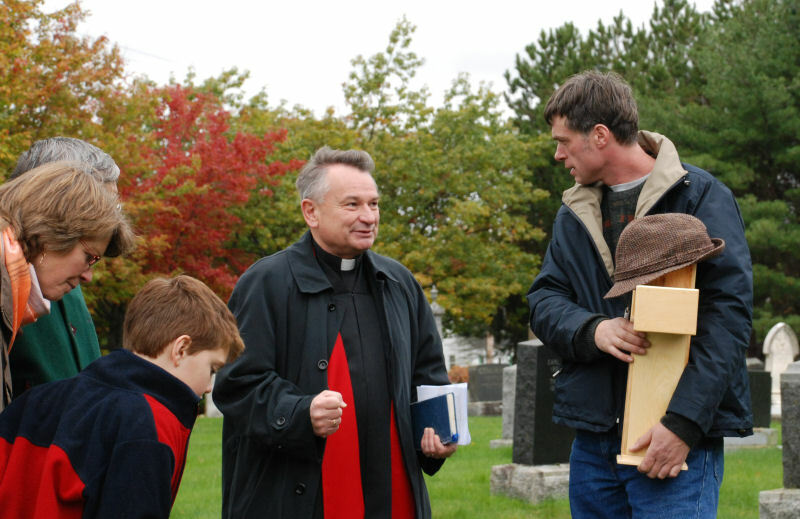 Ivan Gregan delivered a full, rich Christian service of committal. Notable moments included a prayer of confession when we were asked to silently confess anything that lay between us and Flemming, and assurance of forgiveness. Mike holding the urn, which he built. 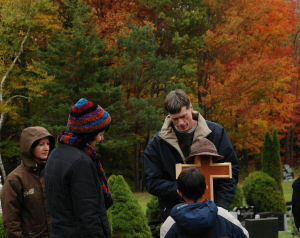 We passed the cross-shaped urn holding his ashes (they’re bone fragments, really) around the circle. This was a very moving experience for each person in their own way, to feel his weight, to carry him a moment in death, to say something quietly, to feel a moment of personal closeness. When the urn returned to my brother Mike, it felt to me that the circle had been closed – a sense of completion and unity. My cousin Danny, who is native Columbian, and his son Guillermo, whose mother was Mi’kmaq, put a crown of sweetgrass and a dreamcatcher on the urn. Then my brother laid it in the ground. We could see the edge of our grandmother’s urn there; Flemming’s urn lies right beside her and a little deeper. Then as Danny and Guillermo offered sacred tobacco to the grave, Danny looked up and remarked on the young eagle that had been circling overhead for a while. Danny told me later that a young eagle signifies means that Flemming was young again. My Dad was like a second father and a mentor to Danny. Little girls danced on his grave. We filled in the hole ourselves, and little girls danced on the sods to tamp them down. 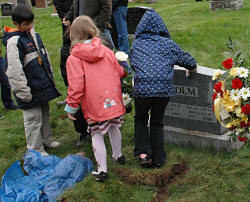 Children dancing on his grave – you can imagine him laughing. Then we retired to the home of Flemming’s cousin Hasse and Susan Lindblad for a lovely reception, with a chance to meet old friends and extended family. Two days later, because of a mix-up with car keys, I was back in New Glasgow and had a chance to visit my great-aunt Emilie (“Mille”) Lindblad, who is 92 and was unable to leave the nursing home. She is totally “with it” mentally, however, and we were both glad for the visit.